Moultrie has introduced yet another innovation in the world of trail cameras. 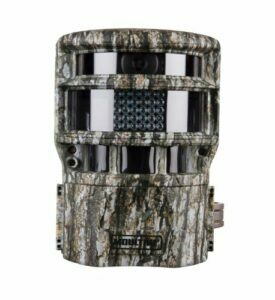 The Moultrie Panoramic 150 is the first trail camera with a panoramic photo feature. No other camera has offered this option yet. As a result, the term panoramic game camera was born and the reviews have been pouring in. With this option, one camera can already do the job of three. There is no need for you to hang many other cameras around. The panoramic feature of this camera has the ability to take three separate photos and combine them into one photo. With this, you can see the entire field in just a single photo. The great thing about this is that it swivels without any noise, preventing it from scaring away any wildlife thriving in the area. Considering that this is the first of its kind, this camera is not perfect yet. It still has some flaws like the overlapped appearance of the photos. It also has a 6-second recovery time, an estimate of 2 seconds per photo, which is pretty quick given that it is storing three photos. These, however, are just some minor setbacks of this trail camera. Even though this camera boasts of its panoramic photo feature, you can still set it up for a single shot mode. The camera will just move to that sector where it detects the movement or the motion of an object. Other features of this camera include a flash range of almost 70 feet. This is great help especially for night time photos as you will surely get clear ones. It also has an 8 MP photo resolution and HD video which is very functional in providing high-quality photos and videos. I had high hopes for the Panoramic 150 to be a contender for best game camera under 150 dollars, but the technology isn’t quite perfect just yet. It is a very innovative product, but with innovation you sometimes lose that polished feel. The main difference when comparing Moultrie Panoramic 150 vs 150i is the quicker trigger speed in the newer model. The sliding mechanism has also been improved, and is now even quieter. Two other things to take note of, is the noticeably clearer night time pictures because of the Illumi-night sensor working with the Motion Freeze to reduce night time blur. With the camera swivelling around to take the panoramic pictures, battery life is impacted quite severely. You can’t expect this camera to compare with normal game cameras that do not move. To me this isn’t really that big of a deal, because you end up with great pictures for the trade-off in battery life. In conclusion, the Moultrie Panoramic 150 is simply a game-changer in the world of trail cameras. It has a great performance which shows little doubt that this is definitely the next big thing in the scouting arena. If you aren’t ready to be adventurous, check out a more traditional game camera.